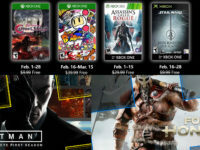 A new month is almost on us here with February and that means new video games that we are going to get for free. Well, video games that you will get for free if you are part of the PlayStation Plus or Xbox Gold services. If you are then you may be in for a treat as the list of titles going live starting next month is here and we have it for you. Again, we get to expand out titles on the Xbox One and PS4 without needing to make any extra spends at our local stores. These video games seem all over the place for this month but given what has just dropped, it makes a bit of sense. With the launch of Hitman 2 not too long ago, it makes sense to add in the first season for those who skipped it. Same thing with For Honor. There is also the inclusion of Assassin’s Creed Rogue, which was one of the more recent video games in that franchise that I enjoyed before the revamp of the series. Also, how do you go wrong with a classic like Super Bomberman R? It will be nice to have more titles to distract us between all of the large titles we have right now. Here is the list of games we will all get for our PlayStation systems starting on February 5th of 2019. Here is the list of games we will all get for our Xbox systems starting on February 1st of 2019.